The Molecular Devices Spectramax M5 Multi-Mode Microplate Reader brings you the power and precision of a dedicated single mode plate reader, but with the space saving flexibility of 5 detection modes in one unit. This microplate reader handles Absorbance, Fluorescence Intensity, luminescence, Time resolved fluorescence, fluorescence polarization, HTRF, and comes with 140 preprogrammed protocols to get you up and running fast. This microplate reader has a wavelength range of 200–1000 nm, uses two monochromators, allowing users to choose their optimal emission or excitation and eliminating the need to change filters. The SpectraMax M5 covers formats from cuvettes to 6-, 12-, 24-, 48-, 96-, and 384-well microplates and incorporates a triple-mode cuvette port, accurate temperature control, and microplate shaking. The Molecular Devices SpectraMax M5 Multi-Mode Plate Reader uses a dedicated photomultiplier tube to reduce stray light and boost the best signal to noise. For luminescence reading by using Instead of lenses this Plate Reader uses elliptical mirrors that maximize transmission, while minimizing wavelength distortion. The Spectramax M5 utilizes powerful PathCheck Sensory technology to measure the depth of samples without being temperature dependent. In addition, when used with Soft Max Pro, the Path Check Sensor of this microplate reader will normalize the well absorbance, letting users calculate directly without absorptive compounds. This microplate is robot compatible as well to help boost productivity and automation and features customizable spreadsheets and powerful graphing tools. 1–100 flashes, delay of 0–600 µsec. before read, integration time selectable between 50–1500 µsec. 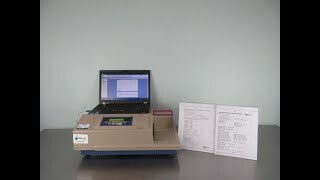 This Molecular Devices SpectraMax M5 Multi-Mode Plate Reader has been fully tested and validated by our service team with a clean bill of health. Instrument includes both UV-Vis and Fluorescence calibration reports and plate readers ships out via freight.